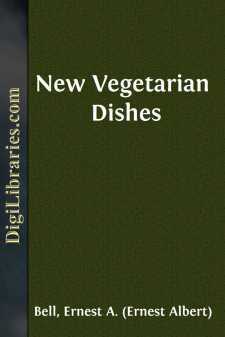 There are already a good many vegetarian cookery books, ranging in price from one penny to half-a-crown, but yet, when I am asked, as not unfrequently happens, to recommend such a book, I know of only one which at all fulfils the requirements, and even that one is, I find, rather severely criticised by ladies who know anything about the matter. To have to live by some of them would almost make a vegetarian turn meat-eater. Most are compilations from other books with the meat dishes left out, and a little porridge and a few beans and peas thrown in. All of them, I believe, contain a lot of puddings and sweets, which certainly are vegetarian, but which can be found in any ordinary cookery book. What is required is a book that will enable us to provide something to take the place of meat, which, while nourishing, shall at the same time be palatable. This the present book aims at doing. Of the 221 recipes given, upwards of 200 are absolutely original, having been carefully thought out and tested by the author herself, and not hitherto published anywhere. Many of them are as nourishing, weight for weight, as ordinary dishes made with meat, those containing beans, peas, eggs, and the various sorts of grain, being the most nourishing. If they are not all found to be palatable, the fault must be in the individual cook, who cannot have put in the important ingredient of feeling, without which no work can be wholly good. The thorough-going vegetarian, to whom abstinence from meat is part of his ethical code and his religion,—who would as soon think of taking his neighbour's purse as helping himself to a slice of beef,—is by nature a man of frugal habits and simple tastes. He prefers a plain diet, and knows that the purest enjoyment is to be found in fruits of all kinds as nature supplies them. He needs but little cookery, and that of the simplest. To him this book will be of little use, except when he wishes to entertain his friends. But there are others who, while not feeling that any moral principle is immediately involved in the matter of diet, yet would like to be relieved from the necessity of eating flesh, possibly on æsthetic grounds, or it may be from hygienic reasons, or in some cases, I hope, because they would willingly diminish the sufferings involved in the transport and slaughter of animals, inevitable as long as they are used for food. To these it is hoped that this little book may act as an encouragement and help.